I just finished listening to this hour long podcast/interview with John Allison, the CEO of BB&T, on the drive into work this morning. It both made me wish that BB&T had a branch in Boston so that I could put my money there, and that I had any experience at all in financial services so that I could work there. I can barely imagine what it would be like to work for a business that used the core values of Objectivism as its own corporate values, and had Atlas Shrugged as required reading for managers. When I got into the office, I was greeted by a great piece at Priniciples in Practice by Craig Biddle, mounting an excellent defense against the academic critics of Allison/BB&T's large donations to universities, stipulating that Atlas Shrugged be included in the curriculum. I know we're not completely out of the woods with this yet, but our 10yr old dog, Jazmine, made it through a splenectomy yesterday without complications, and walked around a bit this morning. She ate some breakfast and peed, and in the words of the vet, is "doing as well as a girl her age possibly could after major surgery." The hopefully non-cancerous mass was the size of a cantelope. It had been biopsied last week and no cancer was present, so I'm cautiously optimistic. Jazmine is tough, funny and smart as hell, and we can't wait for her to come back home. We use BB&T as our local bank (USAA is our main bank). We have been very pleased. I also use them for my cabin business and their small business support is outstanding. There's a picture in our local branch that depicts a building being built, and on the blocks are written words like "Independence" and "Honesty" and "Reality" and "Integrity" and "Reason." I hope your Jazmine is doing okay. Let me know. The kids still talk about your dogs, and your Goof is such a sweetie thing. Even though it's not local to us, you can get a credit card from them - we did! I'm not sure how that supports BB&T, but we love using it knowing that should we ever not pay it off every month, our fees will go to it instead of some other bank. What kind of dog is Jazmine? 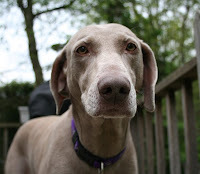 She looks like she could be a Weimaraner (but with the whitish muzzle, maybe a pointer). She's cute in any case. Jazmine is a weim. She's just got a white muzzle because she's an old girl. Her younger "sister" Sophie (they're actually aunt and niece, in that Jaz's litter mate was Sophie's mom) is 2+ years younger but even whiter. Probably from putting up with the Alpha Dog personality of Jaz. Anyway, thanks. She's doing better this afternoon, after an oozing wound scare, it seems to have stopped bleeding. She won't be coming home tonight, though. I have 2 corrections to make to your "Whew" posting. Second of all, Sophie is only 1 1/2 years younger than Jaz. She'll be 9 in May. C. August, it's a good thing you have me around to keep you in line, wouldn't you say?? ?